I've been adopted and now live with my boyfriend Rocky---also from SaveABunny! Hi. My name is Winonna. I am a very beautiful and soft, spayed rex girl. 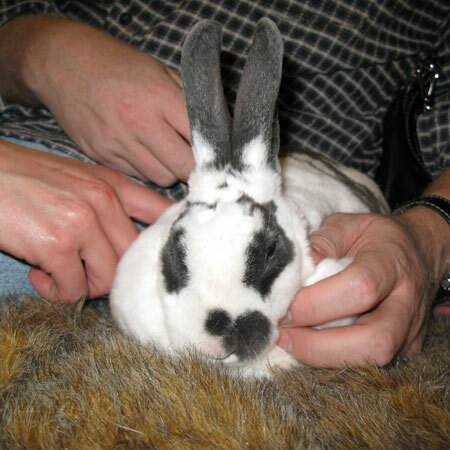 Here I am totally loving being pampered and loved by a SaveABunny volunteer and I am totally in bunny heaven. I have not had an easy time of it and now I am feeling happy and loved. I was frightened and withdrawn at the shelter and I feel like I have really been given a second chance at life at SaveABunny. My idea of a perfect home for me would be with someone who can see my inner beauty and will offer me a safe, quiet place to blossom and relax into the splendid little being that I truly am. I so want to love and be loved. All I need is a chance with the right person. Is that you? Will you love me forever?